Guruvayoor Sahitya Deepika Sanskrit Vidyapeetha started U.G. and P.G. Courses in Sanskrit under Madras University in 1934.Later the institution was affiliated to University of Kerala and University of Calicut respectively.In 1972 the institution was affiliated to Rashtriya Sanskrit Sansthan and named as Guruvayoor Sahitya Deepika Sanskrit Vidyapeetha.The institution was taken over by Rashtriya Sanskrit Sansthan , under MHRD, Govt. of India on 16th July 1979 and renamed as Guruvayoor Kendriya Sanskrit Vidhyapeetha.On grant of the status of Deemed University to the Sansthan, it has been renamed as Rashtriya Sanskrit Sansthan (Deemed University),Guruvayoor Campus. 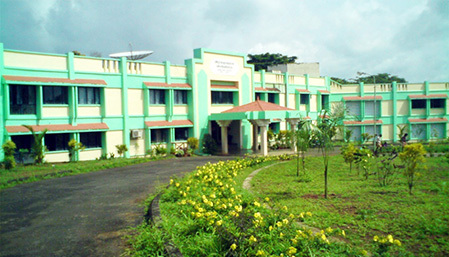 The campus is situated in a lush green locality at Puranattukara at a distance of 10 K.M. from Trichur Railway Station on way to Guruvayoor Temple. It has a spacious building built at a cost of Rs. 2.20 crores by the C.P.W.D. Apart from main building, this Campus also has Boys' Hostel with 40 rooms, Girls' Hostel having 40 rooms, Library building, 7 units of Staff Quarters and a Guest House consisting of 8 rooms. The campus is pursuing research work leading to the degree of Vidyavaridhi (Ph.D.) and is imparting education in Sahitya, Vyakarana, Advaita Vedanta, Nyaya at Shastri and Acharya and level, Shiksha Shastri (B.Ed.) and Jyotisha at Shastri level at Shastri level and Higher Secondary school education called Prak Shastri. Computer Education facility is also available. Distance Education programme was started in 2010, Centre works at P.T Kuriakkose Smrithi Bhavan, Pavaratty near Guruvayoor.